A famous act of symbolic destruction by the IRA in Dublin during the War of Independence, but also a military disaster for the organisation. By John Dorney. 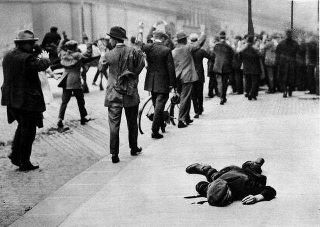 The 25th of May 1921 started out as a normal day in Dublin. Francis Davis, the 63 year old caretaker of the Custom House, the centre of Local Government in Ireland, let his younger colleagues in as normal that morning. He may have been preoccupied, as he often was, by thoughts of the costs of putting his two teenaged children (16 and 14) through boarding school. 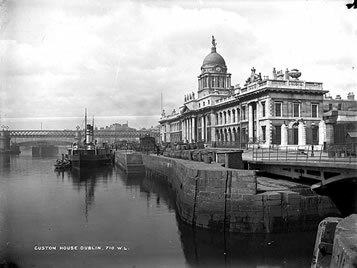 The Irish Bulletin, organ of the Irish separatist movement described the Custom House, a grand Georgian, building whose green dome rose above the Dublin quays, as, “The seat of an alien tyranny”. But a job in the civil service in Ireland was considered a real mark of social advancement, regardless of national views, and one of the clerks who arrived for work that morning was Patrick Lawless, nephew of Sinn Fein MP Frank Lawless. In front of the building, a quay labourer James Connolly (no relation to the republican leader executed in 1916), as usual, spent the morning with the other dockers, unloading barrels from the ships that came up river from Dublin port and laying out the barrels in neat rows for collection along the quay. True, times were unsettled in the city. Every day now there were reports of attacks by Irish Republican Army guerrillas in the streets. Of anonymous killings at nighttime and also of daily bank robberies, road destruction and seizure of mail. British troops, RIC and DMP police and paramilitary Auxiliaries patrolled the streets. Over 100 IRA Volunteers were involved in the operation. Most were very young and inexperienced. As lunchtime approached, bunches of young men in twos and threes were noticed assembling at Sean Connolly Hall, not far from the Customs House. They were later described as, “mostly youths of the working class type”, but some were, “very smart looking”. They were 120 men of the IRA Dublin Brigade’s 2nd Battalion. Some of them, members of the Squad, or assassination unit such as Vinny Byrne and Paddy Daly, or Paddy O’Connor of the Active Service Unit were already hardened to fighting and killing in urban guerrilla warfare. But many of the rest were raw, inexperienced Volunteers whose previous experience had been only of clandestine parading and drilling. One, Dan Head, was an unemployed boy aged 17 of Ballybough, in the north inner city. His father was to say of him, “He was a footballer and that was all. He was a simple boy. I suppose he was more or less a bit of nationalist”. At the Hall, the guerrillas were given a revolver and six bullets each. Some were given hatchets and others told to take them from shops along the way, in order to smash in doors and windows in the Custom House. Tom Ennis, in charge of the operation, told them they were going to burn the Custom House. The Squad men were to seize the police guard, disable the telephone and take the staff prisoner. The Active Service Unit (ASU), comparatively well armed with automatic pistols and grenades would take up a protective position near the railway bridge that ran just in front of the Custom House. A lorry was to pull up outside the building with tins of petrol and at 13:00 exactly, the “main body”, were to rush the centre of local government, and proceed to burn the building. It must all have sounded very orderly. But within minutes the calm of the early summer day in central Dublin was shattered. The staff in the Custom House were in their offices at one o’clock when suddenly, as one told the Irish Times, he, “was faced with strangers armed with revolvers”, who burst into his office. “Who are you?”, he asked. “Never mind that just get along, get along” he was told and they were “herded together”, into the main hall on the ground floor and told to lie down. Francis Davis, the aging caretaker, tried to reach the telephone to call the authorities but was shot dead. It was ten past one. A watching Dublin Metropolitan Policeman put in a call to Dublin Castle and within minutes three lorry loads of Auxiliaries and an armoured car were speeding towards the scene. The Custom House Operation, like the IRA campaign in Dublin in general, was basically an armed propaganda exercise. There were no more than 2,000 men enrolled in the Dublin Brigade and less than 100 of these were active in the Active Service Units of the city’s four IRA Battalions. The city was garrisoned with no less than 10,084 British Army troops and 1,600 police. Of these, the 400 Auxiliaries were the most visible, flying through the streets in their Crossley Tender lorries, weapons sticking out the sides. In any given operation they were the rapid response unit, the first to arrive at the scene of an ambush or shooting. The IRA could do nothing of a truly militarily significant nature given such a disparity of forces. But every day brought news of a new attack in the streets –generally the IRA volunteers flinging a home-made hand grenade at troops or police, firing a few pistol shots and disappearing into the back streets. The IRA had about 100 fulltime fighters in Dublin compared to a British garrison of over 10,000 in the city. On May 12th, for example, there were three attacks in the city. A squad of British troops was ‘bombed’ on Grafton Street, killing none of them but wounding 15 civilians. Another patrol was ambushed in the northside suburb of Clontarf, while at the North Wall an RIC supply lorry was held up and its contents (food rations) thrown into the sea. Three days later an IRA party led by Emmet Dalton seized a British armoured car, shooting two soldiers inside, and used it to try to break Longford IRA leader Sean McEoin out of Mountjoy prison. May 17 and 18 saw two grenade attacks, killing a British soldier and a civilian and wounding 8 more bystanders. The month of May also saw five civilians shot dead in Dublin as alleged informers, all, the Irish Times reported, ex-soldiers. June would see ten more killed in the city and dumped with the label on them, “Spies and informers Beware. IRA’. None of this was in any way enough to threaten to dislodge the British military presence in the city. Normal life for most citizens of Dublin, with the exception of the curfew from 10:30 pm to 4 am and the odd terrifying encounter with either the military or IRA fighters, went on as normal. Robert Chapman’s only brush with the conflict came when, on returning from one of his cycling expeditions to the Wicklow mountains, he was held up by some Black and Tans and forced at gun point to help take down a wall the IRA had built to block military traffic. But military calculations were not the point. On May 14, Sinn Fein had swept the board in the elections to Southern Irish Parliament (a notional entity proposed in the 1920 Home Rule Act) – the latest indication of the electorate’s rejection of British rule. A rival Irish government contested the British right to administer the Irish capital. The point of IRA violence was to demonstrate this defiance. Negotiations behind the scenes for a truce were ongoing – a fact that combatants on both sides occasionally discovered to their surprise. An IRA company under Joseph O’Connor discovered where senior British administrator in Ireland Andy Cope lived, but were expressly forbidden by Michael Collins to touch him. He was in fact Collins’ key contact within the British government. Similarly the British Army arrested senior Sinn Fein politician Erskine Childers on May 9, but were told within hours by their own Government to let him go. Eamon de Valera, President of the Irish Republic, was particularly keen for a spectacular show of force with which to enter negotiations. At a meeting of the Dail cabinet, he had proposed an assault on either Beggars Bush barracks, where the Auxiliaries were based in Dublin, or on the Custom House. The Beggars Bush operation was clearly impossible for lightly armed guerrillas, so it was decided instead to burn the centre of local government, which did not have a military guard. Michael Collins, for one, who had seen much more of the conflict in the city up close than de Valera, tried to keep the Squad, whom he had assembled since 1919, out of the attack, only to overruled by Tom Ennis, who had been put in charge of the operation. Inside the Custom House, the IRA men had herded the staff into the main hall and were sprinkling the building with petrol and bales of cotton. Paddy Daly, the Squad man, was patrolling the outside of the building when another lorry load of Auxiliaries, this time from Q company based in the North Wall, pulled up in front of him. Beside him was Dan Head, the 17-year-old football enthusiast from Ballybough. He was, “a mere boy…I did not take him to be a Volunteer”, Daly later remembered, “he looked about 15 years old”. On seeing the British however, Head, produced a hand grenade and threw it at the lorry. “The whole place seemed to rock”, Daly recalled and he and Oscar Traynor ran down Abbey Street as shots exploded in all directions from both sides. Dan Head was gunned down. 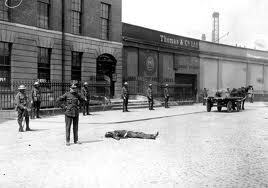 Also shot dead in the opening fusillade was James Connolly, the quay labourer, who had been working on the river side. Inside the Custom House, a whistle sounded, which was the sign to set the building ablaze. The staff in the main hall heard grenades, revolver, rifle and machine gun fire break out outside. “the women amongst us were in a pitiable state of panic,” one man ungallantly told the newspapers, “screams were mingled with prayers”. The IRA raiders had only six rounds apiece for their revolvers and most had to surrender. Most of the IRA men had only six rounds for their revolvers and no heavier weapons. Their fire soon slackened off. The Auxiliaries for their part blazed away into the Customs House, hitting both staff and raiders alike –several of the clerks were hit. The Auxiliaries entered that part of the building firing (despite cries of, “don’t shoot” from inside), to find dead and wounded, among them, “Mr. McKenzie from the Stationary office”, and Patrick Lawless, nephew of the Sinn Fein MP, lying in the hall among discarded revolvers and tins of petrol. Across the river, the ASU and Paddy O’Connor had managed to hold off the first party of Auxiliaries for about half an hour, wounding four of them, but were now out of ammunition and had to make their get away. In any case flames were by now beginning to emerge from windows of the Custom House. The Fire Brigade had been held up by other elements of the IRA Dublin Brigade and arrived too late to get the blaze under control. More military reinforcements also arrived in the form of the Royal Wiltshire Regiment. Some of the IRA men made a run for it. Sean Doyle, was shot and killed by machine gun fire as he tried to get away. Tom Ennis, the IRA commander, was hit twice in the leg but made good his escape by hiding in a passing horse and cart. Another, Ned Breslin, was captured by the Auxiliaries, who, “gave him an unmerciful hiding”. ‘The Custom House was the seat of an alien tyranny’, The Irish Bulletin. The building, designed by the famous architect James Gandon in 1781, burned for five days. Chapman wrote the following day, “Towards Midday, [the tower] took fire and spurted out flame. The copper dome held out till the afternoon, when the flames burst out underneath it and caused it to belly out like the sails of ship. Finally the sheeting gave way disclosing the pedestal of the statue of hope. Huge crowds [are] watching the fire”. The affair was a debacle for the Dublin IRA. Five of their number were dead and three wounded. More importantly, up to eighty had been captured – losses the IRA in the city could not afford. Another three civilians had been killed and seven more wounded. “Its object we suppose was the crippling of the work of the Local Government Board…we fail utterly to understand the minds of those who think it sound warfare and sound patriotism”. The attack was in some respects a cynical sacrifice of so many inexperienced Volunteers, some killed and many captured. For this reason it caused considerable disquiet within the IRA in Dublin. Due to the large number of arrests, the Squad and the Active Service Unit had to be merged into a new formation, named, rather grandly, the Dublin Guard. The attack was costly and also probably unnecessary. The truce was already in the offing and would come about on July 11, 1921. On June 20, de Valera himself was arrested by troops from the Worcester Regiment but ordered to be let go the following day. The Custom House was all but completely destroyed, along with many centuries of local government records. It was later rebuilt to its original design by Irish governments and today houses the Department of the Environment, Community and Local Government. Little trace remains of those who lost their lives there on May 25, 1921. Witness Statement James Kelly, Bureau of Military History (BMH). Five IRA Volunteers were killed, they were: Capt. Paddy O,Reilly, Lt. Stephen O’Reilly, Dan Head, Eddie Dorins, Sean Doyle (M.O. O’Kelly Witness Statement), Certainly three, possibly four civilians were also killed: they were, Francis Davis (63), Patrick Lawless (Clerk in the Local Government Office) and James Connolly (quay labourer). (Irish Times May 27, 1921) the Irish Times reported that one of the bodies had been identified wrongly as ‘James Kelly’ but this seems to have been IRA man Sean Doyle. Irish Times Editorial, May 26 1921. 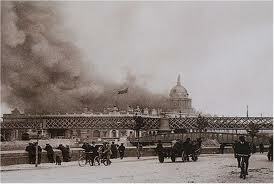 The Irish War of Independence in Dublin, a city of about 320,000 people in 1920, was a low intensity conflict. Nevertheless, the cumulative total of killed and injured in the city was significant – especially when combined with the 487 who died there in the week long insurrection in 1916 and an as yet undetermined number – I have so far counted 170 – killed there in the civil war of 1922-23. Joost Augusteijn, in his study of the War of Independence, “From Public Defiance to Guerrilla warfare” (1996), lists the casualties in Dublin from 1919 to July 1921, killed and seriously injured, as 458; 163 British forces, 55 IRA and 240 civilians. Eunan O’Halpin, in his study, The Dead of the Irish Revolution, the first data from which was published in the collection ‘Terror in Ireland’, lists 309 deaths in Dublin from political violence between 1917 and the end of 1921. He has said in an interview here that roughly half of these deaths, or about 150, are those of civilians. The remaining 159 deaths are not yet broken down into categories but the British military listed their own losses in the city as 25 killed and 68 wounded. They also listed IRA losses as 40 killed and 70 wounded. This would mean that of the remaining 90 combatant deaths all were police – Dublin Metropolitan Police, Royal Irish Constabulary and Auxiliary Division. While the IRA figure looks credible, the figure for the Army seems too low and the figure for the police too high. A further 1,400 suspected IRA members were imprisoned (all but 182 interned without trial) in the city, of whom 6 were hanged and 2 shot ‘shot while attempting to escape’. Written by: John_Dorney on 23 May, 2012.on 29 October, 2016. 23 Responses to "Today in Irish History, The Burning of the Custom House, 25 May 1921"
There is a monument to the IRA men who died in “The Battle of the Customs House” on the north side of the building. I can’t recall if their names are listed or not. Somethings a miss when a caretaker can send his two sons to a boarding school in 1921 ? plus how many men of 63 had children of that age then ! Earnan the IRA men`s names are on the monument. Sean, the age does seem strange but that’s what the Irish Times reported. Hi Folks, apologies for resurrecting(!) that question. The age of Francis James Miall Davis, the English Caretaker – properly Housekeeper according to living descendants – was indeed 63 (born near Aldershot in Dec 1858). A very good point by Sean – how did he afford private schools (Alexandra College & Mountjoy School) for his kids in Dublin. Civil service pay must’ve been good back then…..
As I recall, Ernie O’Malley’s (younger?) brother Percy was one of those captured and later died trying to escape – for real, it seems – breaking his neck, presumably trying to get over a wall. 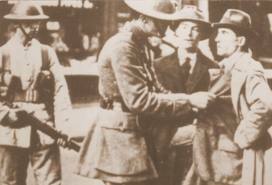 Ernie O’Malley’s younger brother Charles was killing fighting on the anti-Treaty side on O’Connell Street at the start of the civil war in 1922. It’s the first I’ve heard of Percy to be honest Daniel. Corrections: his brother’s name was Cecil, and it seemed he actually got away: “My brother, Cecil, a medical student, had been amongst those arrested [at the Custom House]. I found later he had to jump from a top window with a companion who was shot dead as he jumped. A passer-by cross-eyed with excitement brought home word that my brother had been killed and that the dead boy was a prisoner.” (On Another Man’s Wound, 1979, pp.326-7). I missed that, thanks Daniel. Do you have a source for the photo after reference 17 showing a dead body with prisoners being marched away? Hi Folks. Again, apologies for lateness of this reply….. One souce for an uncropped version of that photo is Whytes Catalogue 2015: https://whytes.infinitebidding.com/index.cfm?method=getLotInfo&lotref=7EC4BE3B3D&seq=229. It appeared as in John’s article in an English “illustrated newspaper” in 1921; in March 1938 the uncropped version was in The Kerryman. I don’t know the identity of the photographer, can’t find any credit. But I am 99% certain it shows Dan Head the 17 yr old Volunteer killed in the operation (based on military inquiry file – auxiliary police on where body found & and medical evidence on wounds sustained). Thanks for these comments Des, very informative. John, good article. I can confirm 4 civilians were killed (The “victim” James Kelly originally misidentified by his unfortunate wife was alive and well under arrest in Arbour Hill prison). The 4th civilian killed was John Byrne, a Poulterer in his mid-20’s and single, from 14 Killarney Street. He was an innocent by-passer cycling home for lunch from Rathmines, as he did daily, when shot in the back. Irish Independent, 1 June 1921. He was the 8th victim identified. The death of Sean Doyle, IRA, was subsequently publicised on 2 June. Definite total of nine dead as a result of the Burning. Thanks for your input Des. The Bureau of Military History website in its witness statements has much on this event. One man, a Tom Lillis I think, claims that that his shooting at the Auxilaries helped Oscar Traynor get away. Another man has a differing account of this. Hi Angela. A valid comment, the spelling of Daniel’s surname has indeed appeared as Head & Heade. I’ve wondered if that was down to pronunciation…. However, following research into his background, I can offer some evidence the family name was actually Head. Dan was born in Holles Street Maternity Hospital on 9 July 1903, birth registered as Male Head, of 53 Lower Charles Street on 28 July. He was later christened Daniel Joseph. His parents were Michael Head 1871-1947, a Carpenter from Dublin and Mary nee Hammond from Dungarvan, Co Waterford. His grandfather Michael Head c.1835-1905 of 8 Cook Street, Dublin was described as a Fenian of 1867 & a member of the Irish Invicincibles in a memorial notice for Dan in 1938. That same Michael senior is recorded at that address (as Ml. Head) in the 1851 census transcription by Dr Chart.The later family entered the surname Head on their census forms in 1901 & 1911. It is also spelled that way in the military iniquiry file on his shooting at the Custom House (most importantly in his father’s evidence of identification); on his Death Cert; and on the family headstone in Kilbarrack Cemetery. Family notices inserted in Dublin newspapers for the anniversary of his killing also used the spelling Head (Notices appeared from 1922 to 1951). Finally, living relatives have confirmed to me that the surname was and is spelled Head. I hope above is of some interest. Des.